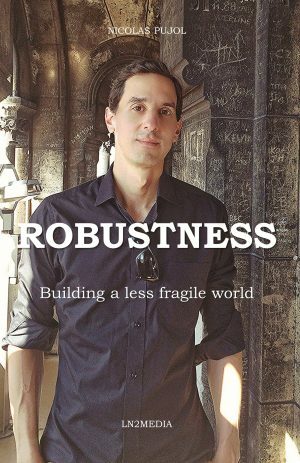 I often ask myself whether I am eating what one should be eating – you may have noticed. 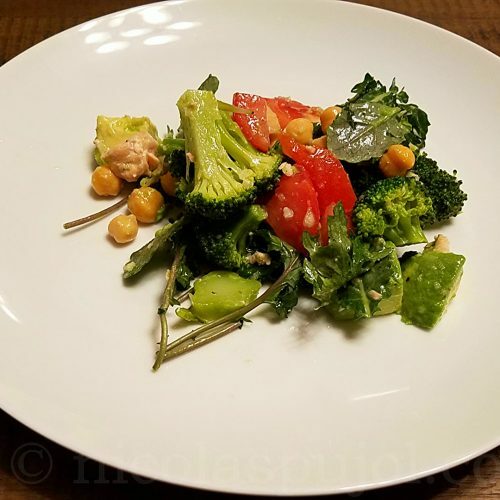 This is how this garbanzo beans, tuna and broccoli salad came to be. 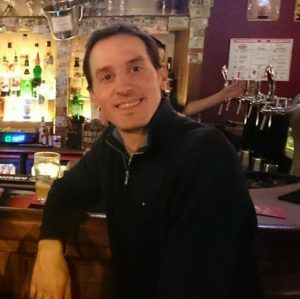 A few years ago, before I started researching nutrition, I was chatting with my doctor about which diets are more or less healthful. 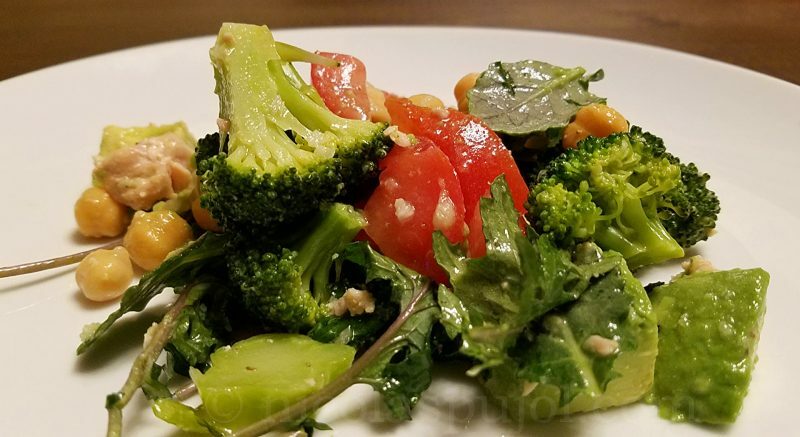 She said that as far as she knew, the pescetarian diet was likely the best one to follow: avoidance of meat, a focus on plant-based foods, but without completely removing the animal proteins from the mix. These animal proteins in this case include fish, seafood, and in some cases eggs and dairy. For tonight I was thinking about what to make. We were just going to have something light, so the salad is the meal. That’s it. No entree. 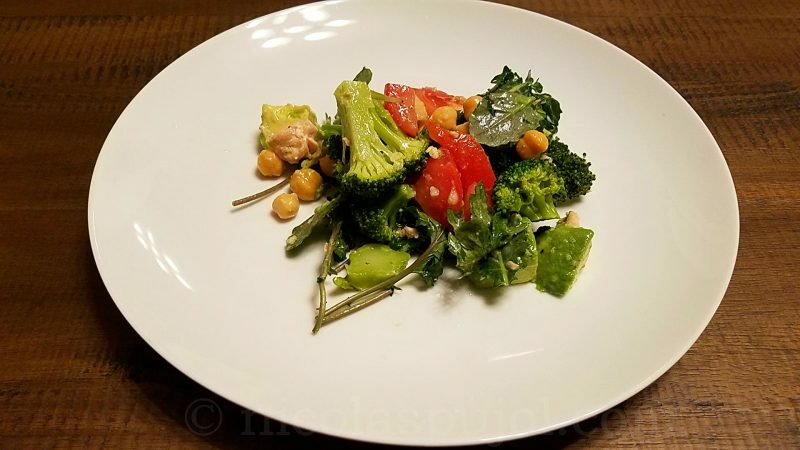 The three main ingredients of this salad are garbanzo beans, tuna and broccoli, in terms of quantities and volume contribution to the overall dish. However it also has 2 tomatoes, 1 avocado and a few extra leaves of baby kale. We happened to have these vegetables handy, you can use what you have in the fridge that would blend well. Cut the broccoli and boil it for 5 minutes. 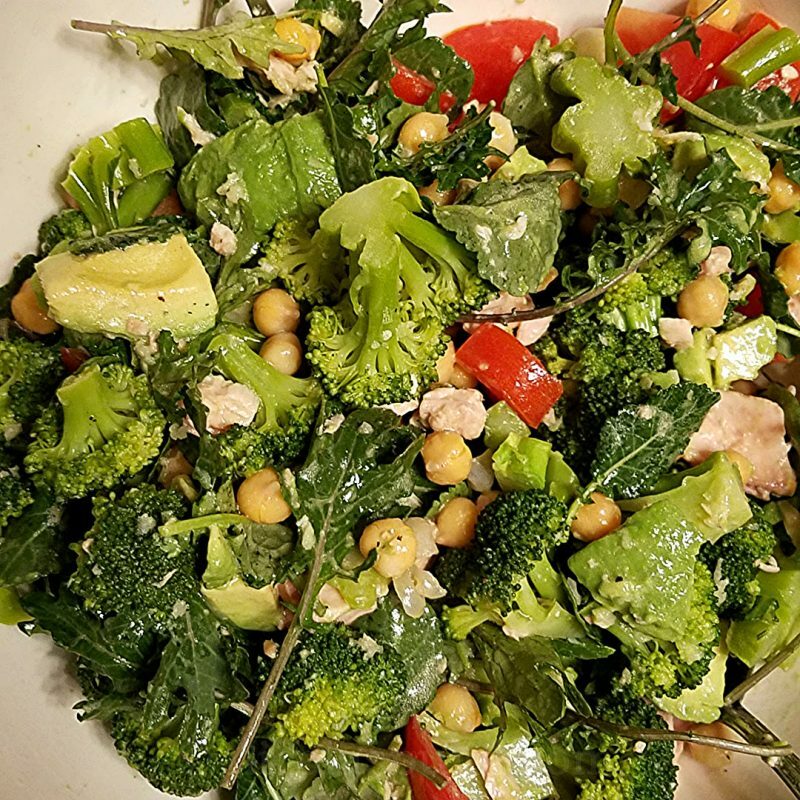 In a large salad bowl, place the baby kale, garbanzo beans, tuna in small chunks, and sliced avocado and tomatoes. Make the dressing by crushing garlic and mixing in the lemon juice, mustard, olive oil, salt and pepper. When cooked, rinse the broccoli to cool it down a bit. Then add it to the salad bowl. Mix in the dressing, stir and serve immediately. 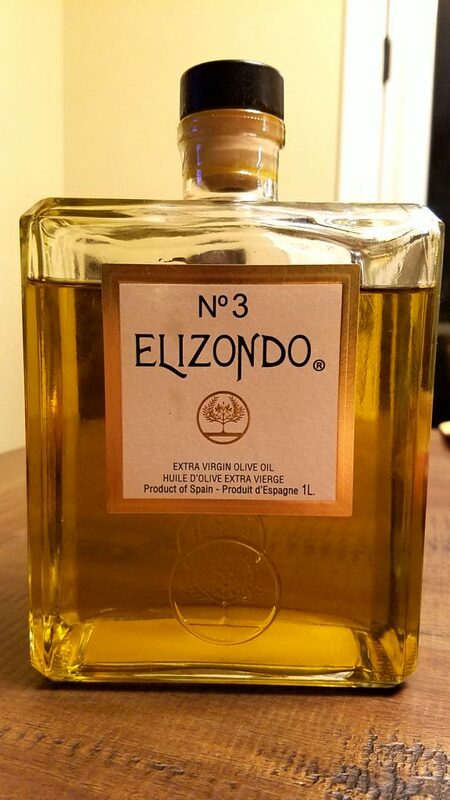 As a side note, our friend Rossana brought us this designer bottle of olive oil, Elizondo n3. It looks like a bottle of Chanel perfume, except it’s delicious Spanish olive oil. Who needs Chanel when one has Elizondo? It’s the best looking oil bottle I’ve seen to date. We use it now for our salads and other meals. Thanks Rossana!